When my head hits the pillow at night, I am most likely thinking of my breakfast the next morning. Often, more specifically, I am inventing breakfast taco combinations in my head as I try to fall asleep. I am extremely passionate about breakfast, and there are few things I love more than taking the time to make myself a nice one. To me, breakfast tacos are pretty close to a perfect breakfast: they’re simple enough to make every day (if you so desire…), they’re filling but don’t lay heavy in your stomach like a stack of waffles, and most importantly, you get to eat a taco before noon. When I’m eating a truly great one, I’m filled with more Texas pride than if I just stormed the Alamo myself (it should be said here that Texas History was the first class I ever fell asleep in). 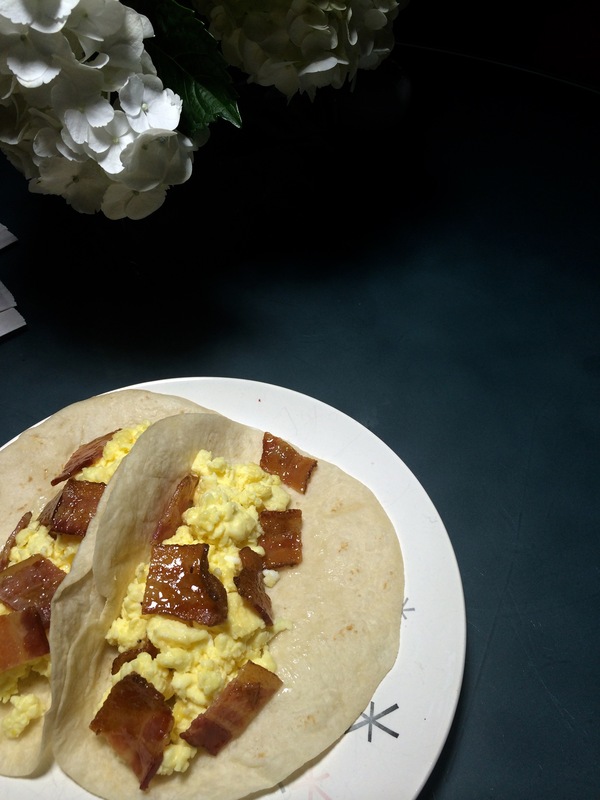 This morning, though I didn’t try out one of my nighttime-fantasy-breakfast-taco-inventions, I did make one with Ina Garten’s maple roasted bacon. That idea came to me last night and I was so excited to make it this morning that I couldn’t get back to sleep even though I woke up way too early for it to be just three days into my summer vacation. The taco DID NOT DISAPPOINT. This bacon is outta this world, y’all. 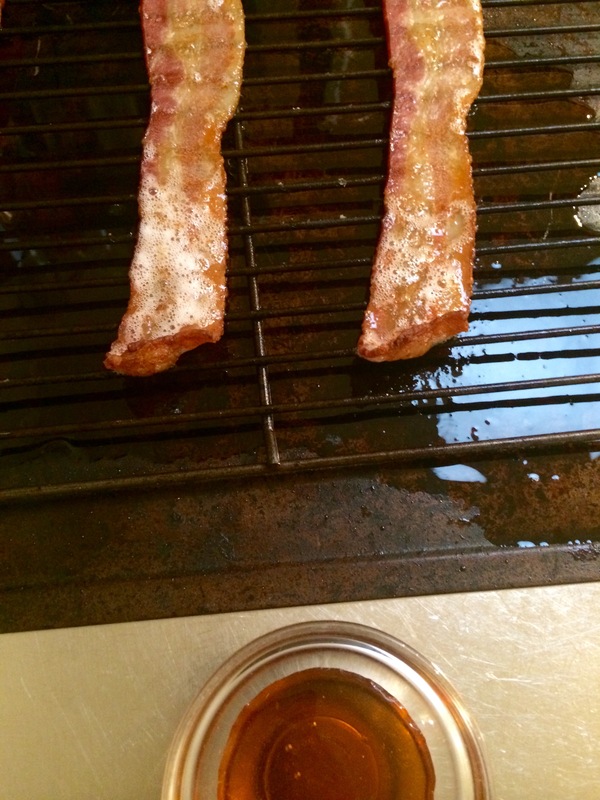 Crispy and sweet and perfectly maple-roasted…I made an extra slice for myself just to eat. 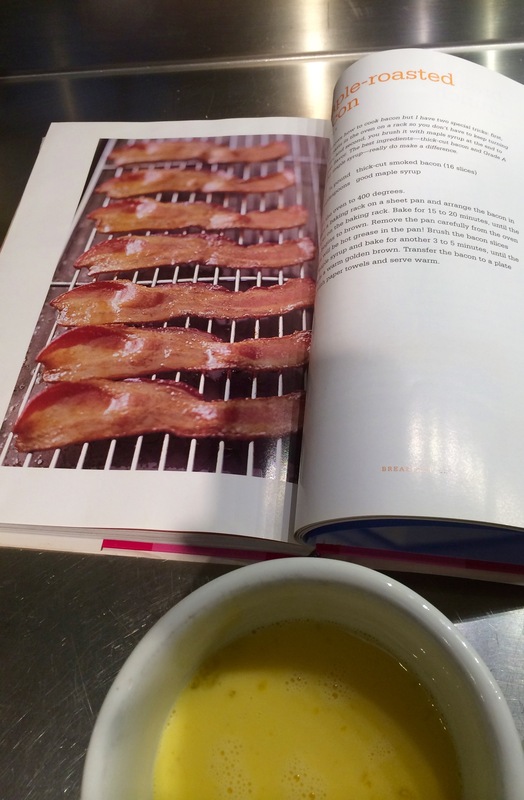 It’s so good and so easy– line up your bacon slices on a baking rack over a baking sheet, roast at 400 degrees for 15-20 minutes, brush it with maple syrup, then stick it back in the oven for another 3-5 minutes. Otherwise, this is a pretty self-explanatory recipe: soft scrambled eggs cooked over a low heat, mozzarella cheese cooked in with the eggs, and a flour tortilla warmed in the oven. Normally (and I’ve just discovered this is an anomaly), I’m partial to corn tortillas, but NEVER in breakfast tacos. On one of our many taco dates during our sophomore year of high school, one of my best friends and I talked it out for a long time and realized that corn tortillas are simply too abrasive in breakfast tacos. Flour all the way.